Today, we are going to make a journey to France. At the great model railway exhibition in Leipzig, Germany, the French model railroad club “Amis du Rail 67” presented its beautiful layout built in HO scale. On the modular railway layout, there are one large railway line in HO scale, two railway lines in narrow gauge, and a miniature street for vehicles of the famous Faller Car system. The whole display takes approximately 15 meters in length and 5 meters in width. Pilentum was absolutely fascinated by the good work, how buildings and trees and the landscape were modeled. Furthermore, the background consists of a beautiful painting. I guess, the background image was painted by Patrice Hamm, a famous artist in railway modelling. The model railroading club and its members created a very special atmosphere: The landscape is not overcrowded with gimmicks. It is a simple, but very beautiful landscape including a small town with half-timbered buildings. But the most important thing, of course, is the rail transport traffic. On the main line of the railway, we can discover a lot of the finest steam locomotives and steam trains used by the French State Railway. There are also some diesel locomotives and, for example, the famous French railcar. Therefore, there is no catenary, because the French model railroaders do not prefer high-speed trains, only steam trains and freight trains. 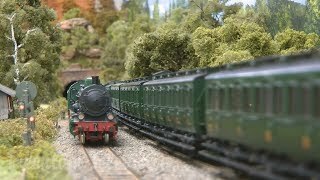 On the two narrow-gauge lines some ugly model trains running on two independent loops. Mostly, there are railcars for passenger traffic running between the small villages. Finally, there is also a miniature car system. There are trucks and buses driving behind the railway lines.